On May 1st I set my goal, to finish my addition to a round robin block. This is where I stood at the beginning of the month. I auditioned fabrics from my stash. I purchased more FQs in Paducah. I bought more yardage at my LQS. I bought more fabric on my way to NC. In the end, I think I have enough fabric for a whole 'nother quilt! My original idea was to repeat the drunkard's path blocks in my round. I first tried using my Strips and Curves templates, but the size wasn't right and I wasn't ending up with sufficient seam allowance. I then purchased a circle tool designed for this purpose. It actually worked very well, but it took a lot of time, there is a lot of waste, and I still wasn't happy with my fabric choices. Then I remembered a technique I learned at the Pigeon Forge show. Cindy Williams (a/k/a the Math Whisperer) improved on a shortcut piecing technique for flying geese to be put into a staggered strip. Hop over to Elm Street Quilts to see how others did on their One Monthly Goals for May. 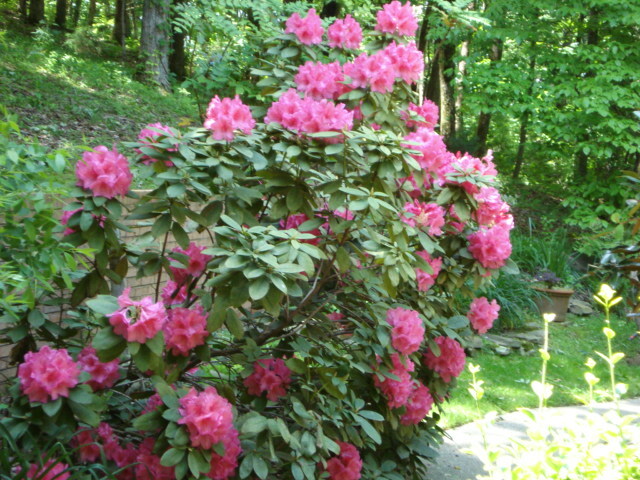 Remember the sorry state of my rhododendron? Last summer's drought and late February freezes took a toll on my beloved bush. I waited till it was well past blooming season (even though it never bloomed) to prune it back. Today was the perfect day to attack the mess. I saved any branches that exhibited the slightest sign of life. Can you see the brighter green of the new growth? It looks like a bud might have formed, too. The resilience of Nature is amazing! I can finally see my favorite yard art. Now it's time to attack the wall before it becomes a jungle again. NCQS is an annual meeting hosted by a different NC guild each year. The venue is usually a college campus so the dates will vary with the school's holiday schedule. Full-time participants have the option of staying in one of the dorms on campus. They always seem to assemble an array of talented teachers, a few known nationally and a lot of regional talent, as well. So I arrived in Raleigh early enough on Thursday that I was able to make my way to William Peace University to check in, pick up my credentials, and scope out my classroom locations. I met The Joyful Quilter who was "white-gloving" the show and we admired the quilts together. I apparently forgot to photograph the info card; my apologies to the maker(s) and quilter. I really love the variety of the traditional blocks and the setting. Irony was pieced and quilted by Connie Kincius Griner. She was inspired by an internet posting that defined "irony" as the opposite of "wrinkly." Although I felt like the ironing board might tip over, I admired her original interpretation of the theme. My Sister's House was pieced and quilted by Irene Grimes whose sister lives in Greece. The pattern is Brownstones by Flavin Glover. My Modern Quilt was pieced and quilted by Gina Ross. She started it in a class with Christa Watson on How to Make a Modern Quilt. This hand-pieced beauty by Carol McDowell absolutely blew me away (sorry about the lady's behind). It was machine quilted by Kim Buterbaugh. Carol was inspired by patterns in books by Becky Goldsmith and Willyne Hammerstein. I like when credit is given to patterns and their designers. While most of the info cards at NCQS gave proper attribution to designers, it would have been nice to know the actual pattern name if someone wanted to make it. So that's a quick look at NCQS. Next year's symposium will be at UNC-Asheville, hosted by the Asheville Quilt Guild at the end of May. A number of modern and art quilters will be on the faculty, in addition to quilting legend Georgia Bonesteel, a NC native. Linking with LeeAnna at Not Afraid of Color. The North Carolina Quilt Symposium is now history and I have returned to our hillside retreat. Really, though, our little hill is nothing compared to the hill up to my SIL's cabin at Maggie Valley! Remember this shot from last Thursday? A drizzly rain with low-hanging clouds. I was so grateful that I had Mica tooling up the mountain side; I don't think my old vehicle would have made it! The rain clouds were breaking up, but the fog had settled in the valley. By the time I had the van loaded and was ready to head down the mountain the fog had pretty much cleared; however the rain returned. A word of advice: Don't leave home in a new vehicle without getting the full rundown on how everything works! Necessity became my teacher. Fortunately the wipers worked pretty much like my last van. I now know the proper sequence for starting and stopping the engine and how to operate the headlights. I discovered the difference between popping the gas hatch and popping the hood latch. Never did figure out how to operate the automatic rear hatch; I think it needs some work. It took several days for me to work out the proper setting for the AC, including how to defog the windshield. There were times when I expected the little screen behind the steering wheel to say "You idiot!" It's just plain scary when a machine is smarter the you are!! which is why I was inspired to tell you why I like to travel. Blame it on The Folks. My mother (The Mama) had taken a 6-week tour of the West in her best friend's Model A Ford in 1931. They put over 10,000 miles on that brand new vehicle, visiting just about every National Park between Columbus, OH and the West Coast. Our family relived that trip on two separate vacations in 1954 and 1955 and I was bitten by the travel bug big time. I have visited every state except one or two in the north-center of the US, as well as several European countries. I like visiting new places. So many people around us growing up were content to go to the same places over and over. Whether it was to grandmother's farm or the Florida beach, it was the same thing year after year. Not for us. We did go to Florida one year to visit relatives in Orlando (pre-Disney World, made it to the beach only one day), but we also took extended vacations to New England and Canada. This is not my first visit to NC Quilt Symposium, however. I like family memories. I established the travel routine with my own family, as well. I'm not sure Son-1 and Son-2 always appreciated it, especially the "educational" elements I tried to include. But for every cheese factory tour there was also a sports hall-of-fame visit to balance it. We stopped at many overlooks, read markers, and hiked many trails in National Parks, but we also played animated board games by the campfire at night. Lots of laughs, lots of memories! I like to drive. That's a good thing since it's over 500 miles to Raleigh! I enjoy watching the scenery slide by, ever-changing with the lay of the land. At least I've been able to split the trip each way with an overnight stay at SIL's cabin in Maggie Valley, NC. It's quite a haul up the hill to this cabin, but Mica (my new wheels) handled it like a trooper (though she was VERY hot by the time I got here!). I like audiobooks. I enjoy the solitude of driving alone with time to think or listen to a book. I don't read much; I can't find a comfortable distance to focus on the page and it really tires my eyes. But I DO enjoy being read to. Back in my working days I would wish for traffic so I could listen to more of the current book. I also would go out and drive around on my lunch hour just to listen to my book when it got to the exciting part! I've gone through most of the Sue Grafton alphabet, the Ladies Murder Club mysteries, and Stephanie Plum adventures. My accompaniment on this trip is Mrs. Grant and Madame Jule (a/k/a Julia and Jule!) by Jennifer Chiaverini. Yes, the same author who wrote the Elm Creek quilt books! Her historical novels are very well researched and well written -- I say that based on the only one I've "read" so far, Mrs. Lincoln's Rival. I'm finding this one just as engaging. Stay tuned for daily reports. I'm posting this early while I have an internet connection. Head over to Not Afraid of Color on Thursday to see what other quilters like. Once there was an aging grandmother who had been driving a soccer mom's van for 10 years. It had been a very serviceable vehicle, taking Silverlocks and her sewing machines and associated gear to many a retreat and class. It also took Silverlocks, her friends, and her beau on many a road trip, logging over 128,000 miles along the way. But Silverlocks sensed that a major repair bill was on the horizon because the steep hill she lives on has taken a toll on the van's brakes and tires. It was time to consider a replacement. And since Toyota had been begging to get her 2007 Sienna, supposedly much requested by other customers (if you believe that, I have this bridge ...), she ventured into the dealership to try some on for "fit." The Rav4 was too tight for her long legs. The Highlander cargo area was too high to heft her sewing gear up to. The Sienna, no surprise, was JUST RIGHT! Just in time for an upcoming trip to Raleigh, NC for the NC Quilt Symposium later this week. I have bits in the box to make a few more as the month goes on. I also started pulling out bits for a Scrap Jar Star block. I was frankly surprised at how many green scraps I have. Until I started reorganizing my fabric shelves. Green is what I seem to have a lot of. I certainly don't consider it a "favorite" color; maybe it's just that there are so many different shades of green. The only color family I have more of is yellow/gold. Linking up with Angela at soscrappy. Yes, I'm finally jumping in to Lee Anna's weekly linky party -- I Like Thursday. Not that I am particularly partial to Thursday, but since it's Thursday, here's a look at what I like. I like living in the woods. Along with the deer, turkeys, turtles, and an occasional red fox or armadillo. We don't live in the country; we live in a subdivision. It just so happens that this acre and a couple more on both sides of us were only cleared enough to build on. We truly live among the treetops, and I love it! I like my garden -- or at least what's left of it after last summer's drought. It never occurred to me how many days, really WEEKS, we went without rain last summer. I should have been out watering; instead I just figured surely it would rain tomorrow. 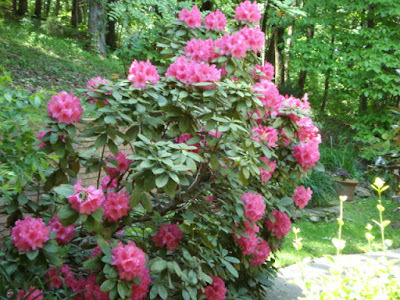 I love my rhododendron even though it doesn't show. In a normal year it would be looking like this right now. Instead, it looks like this. Between the drought and oddly-timed freezes that nipped the buds, it needs some serious pruning if it's going to recover. I do see some signs of new growth so there is still hope. I like the different hues/tints/shades of green in the garden. This variegated euonymus was pruned back drastically last year because it was beginning to restrict the pathway to our main entrance (which faces the rear). It is coming back with gusto and you can bet I'll keep it well watered this summer. Another shade of green is almost burgundy. This bush was transplanted as a twig and has doubled in size every year. In the shadow of this bush, but not visible in this photo, is our most prolific Huechera (coral bells), also a gorgeous shade of burgundy. Every year I plant more huechera, but apparently they don't like the environment because I've not been very successful in keeping them going. I like Lenton roses (Hellebores). These evergreen perennials thrive in our shade garden. They are the first things to bloom -- usually in February, but this year they bloomed in January! They are still blooming, but the recent rain has just about wiped them out. They self-propagate so even with the drought and cold, they've managed to bounce back. I like unusual plants. We are fortunate that the previous owners were expert gardeners and they invested in a lot of unusual and collectible plants. One I've been calling Arum (probably inaccurately) has arrow-shaped leaves and a jack-in-the-pulpit-like flower. The recent rain and cool temperatures have taken a toll on these blooms, too. When the bloom fades, a bright orange seed pod remains. It stinks! Another weird plant that I have been unable to identify is this large-leaf specimen. The underside of the leaves, which get quite large, is a deep burgundy. In the summer it will put up a scraggly yellow bloom. I've not found anyone who can identify it yet. Are you game to try? Crape myrtle blooms late in the summer when not much else is blooming. But it is still attractive in the winter because of its peeling bark. Normally I would cut back those suckers at the bottom, but I'm considering letting it become more bush-like this year rather than tree-form. I like our hillside retreat. Even though we chose this house because it would accommodate the needs of my disabled mother-in-law, we couldn't have found a more beautiful, peaceful environment to make our life more pleasant during the last 9 years. We will be sad to let it go, but we are looking forward to a new life with just the two of us. Drop by Not Afraid of Color to see what Lee Anna and others like. Do you ever stop to think about certain words? Take GREEN, for instance. Think about all the different ways we use that word. Green is the Rainbow Scrap Challenge color for May, so I dug through my 1-1/2" and 2-1/2" bins to see what I had on hand for some Chunky Churn Dash blocks. So many shades of green, from yellowish to bluish. I found enough candidates to make nine total CCDs. Here's the first two. I love these little fellas! Angela at Soscrappy hosts a linky party every week for RSC participants. Check it out! and make one lose track of time! Since DH was finishing up a small consulting job, I accepted an invitation to go to a retreat hosted by the guild I used to belong to. I was hoping it would help me get back into quilting (and blogging) after a month off. So let's see how I did. The first project was to trim Chex Mix which had recently returned from the LAQ. I am so in love with this quilt, made from leftover 9-patches from another project. The blocks are a variation of Nancy's Choice (I think), but I made the outside round of each block a bit larger so that the star points would "float." That way I didn't have to match points between blocks or use sashing to separate them. I also love the quilting design in each block. My next project was adding the diamond sashing to the top and bottom of Poppies. The blocks are 4-patch posies. I don't have enough of the fabrics to do sashing on the sides. I'm still considering adding a small black border all around, but hadn't brought additional fabric with me. My next project was Bonnie Hunter's 2016 mystery, En Provence. I had vowed I would not make it and with each clue I restated that vow, but somehow I managed to make everything up until the final construction. Because I wasn't happy with my fabric choices, the project stalled. Nevertheless, I was determined to make something with the pieces/parts I had already done. This is the best I could come up with. I got the center medallion portion together using the finished star blocks and portions of the alternate blocks. I am using the neutral 4-patches to fill the corners and will pull some more of the lavender used in the star blocks as setting triangles in the border (I borrowed some lavender from a friend to see if my idea would work). To be finished later. And I still have a pile of purple 4-patches to work into another project. Next up another Bonnie Hunter mystery, this one from 2013 -- Celtic Solstice. I really liked this design, but couldn't work out the pieced border. Apparently I hadn't made enough Peaky/Spike units, yet I thought I had made the number I counted in the picture. Never could get it to work out and so had put it aside (for 4 years). I got the white inner border on and started adding the pieced borders, but I still didn't have the right number of units so I made a few more that didn't match. Not happy with that solution I stopped work. I have just now figured out where I went wrong; the inner border is too wide. Another project for another day. I put some spiderweb blocks on the wall to audition a background fabric, but decided the red was not the right choice, or at least not the right shade of red. So I spent the rest of my time cutting a new project, a sale kit I purchased on Craftsy last year. All-in-all I have no "finishes" to my credit, but I have gotten back a bit of my quilty mojo. This month is relatively clear so I should be able to make some more progress on these and other projects. While I anticipate finishing up a few things this month, I'm going to repeat last month's goal and simply aim to add another round to the next round robin block currently in my possession. Here I'm auditioning some fabrics in my stash. I acquired a few FQs in Paducah that I thought would work, as well. So my OMG for May is to add another round to this quilt top by the third Saturday in May. I'll be linking with Patty at Elm Street Quilts.